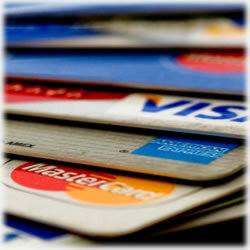 Ever wondered about how much of your information your credit cards are giving to companies? It’s not at all uncommon to see stories in the media about various hijackings of websites where fraudsters have stolen millions of credit card numbers and other personal information – and those stories are increasing wit each passing day. But for the run of the mill charges and all the bits of data that’s traveled the technological highways, how much of a trail do our credit cards leave in their wakes? We set out to discover those answers. We were surprised by some of what we found and other bits of information didn’t cause us to think twice. You pulled through the drive-through at your favorite fast food breakfast haunt. You ordered a breakfast burrito and an iced latte. From there, you ran into the local pharmacy to pick up your prescription and some breath mints before heading to the office. Several hours later, you’re buying new skis online in time for a birthday delivery for your eleven year old daughter. You had sushi for lunch and you filled your car up on the way to the airport. Finally, around 7 that evening, the stranger knows you made your flight and are well on your way. You felt guilty about the iced latte because moments after you swiped your credit card, you pulled into the pharmacy to pick up your cholesterol medicine (that you charged, too). And judging by the charges your credit card revealed last night, she’s quite confident that those breath mints are designed to mask your breath following your night on the town. She knows your daughter is going to be really excited with the new skis because she knows your wife took her shopping earlier in the week for a new (overpriced, in her opinion) ski coat and boots. She knows you had sushi for lunch because you charged that too. Wondering how she knows that you made your flight? For starters, you didn’t cancel the reservation (that you’d put on your credit card last week), but you did stop into the airport’s lounge to pick up the latest copy of the Wall Street Journal and a few magazines (with, naturally, your credit card). The point is, your credit card transactions are revealing every moment of your day to folks who don’t know you and who would likely never compromise your privacy. In fact, just because the access is there doesn’t mean anyone’s stalking you or even allowing their curiosity to take over from time to time; still, it’s always there. While it may be a bit unsettling to know just how much information about you and your purchases is left vulnerable, the real problem begins with credit card companies teaming up with advertisers. The credit card companies can legally sell your information, provided that information is stripped in its entirely of any identifying information. The advertisers are not so much interested in who you are, but rather, what you buy. This allows them to really take advantage of their budgets with targeted advertising efforts. Law enforcement has access to your buying habits too, though they are bound an entirely different set of compliance guidelines should they wish to plunder around your credit history. Advertisers aren’t held to those same high standards – besides, of course, the ethics behind your card company selling your name, phone number and address. You might be wondering first, how legal it is for some folks to know all about you, but more importantly, there has to be a way to prevent this from happening, right? You should know all these scenarios are grounded in legalese and it is indeed legal for them to use that information as they see fit, albeit in a generic and non-identifiable way. Of course, this won’t have many of us leaving our Discover and Visa credit cards at home, but it does give you something to think about as you hit that big sale this weekend.